Coastal Powder Coat Inc. is now open! 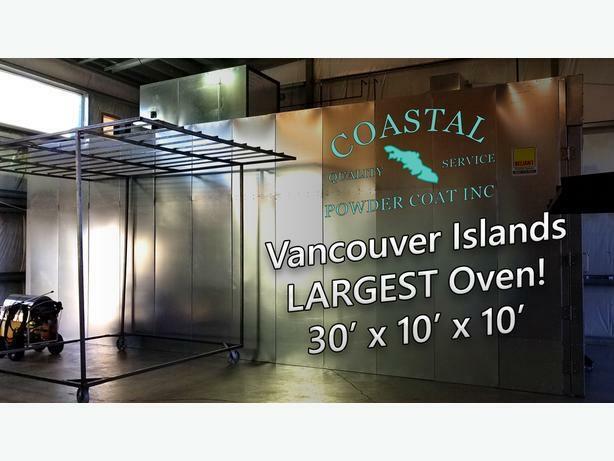 Parksville's newest powder coating company, and the LARGEST oven on Vancouver Island (30' x 10' x 10'), which enables us to powder coat larger items such as boats, gates and truck bodies which would otherwise normally be to large! Equipped with our own in-house sandblasting booth and partnering with local veterans of the industry, we're excited to provide a top of the line service focused on a premium end-product and passionate customer service. Powder coating is a dry finishing process that is available in a wide variety of colours and used on a wide array of metal products. More and more companies specify powder coatings for a high-quality, durable finish, allowing for maximized production, improved efficiency, and simplified environmental compliance. Used as functional (protective) and decorative finishes, powder coatings are available in an almost limitless range of colors and textures, and technological advancements have resulted in excellent performance properties. Powder coating is a high-quality finish found on thousands of products you come in contact with each day. Powder coating protects the roughest, toughest machinery as well as the household items you depend on daily. It provides a more durable finish than liquid paints can offer, while still providing an attractive finish. Powder coated products are more resistant to diminished coating quality as a result of impact, moisture, chemicals, ultraviolet light, and other extreme weather conditions. In turn, this reduces the risk of scratches, chipping, abrasions, corrosion, fading, and other wear issues. It's durable, looks great and it lasts a long, long time. In addition to being durable, powder coating is an attractive choice due to environmental advantages. Automotive, Motorcycle & Marine Parts, Gates, Railings, Fencing, Metal Furniture, Decorative Wrought Iron, Industrial Parts, Machinery, Equipment and More!